Clear skies. Low 52F. W winds shifting to SE at 10 to 15 mph..
Clear skies. Low 52F. W winds shifting to SE at 10 to 15 mph. Jenny Douglas sings "Matchmaker" from "Fiddler on the Roof" during the warm-up before the performance of an adult musical theater class at Live Theatre Workshop. Director Michael Martinez talks to the adult musical theater class members before their performance. During the first class he told the group: "First, I want to tell you, you shouldn't be scared. The second thing is, you should be scared." Director Michael Martinez plays several Broadway tunes before the performance. Diana Wilson and the troupe rehearse before the finale of the Adult Musical Theater class. 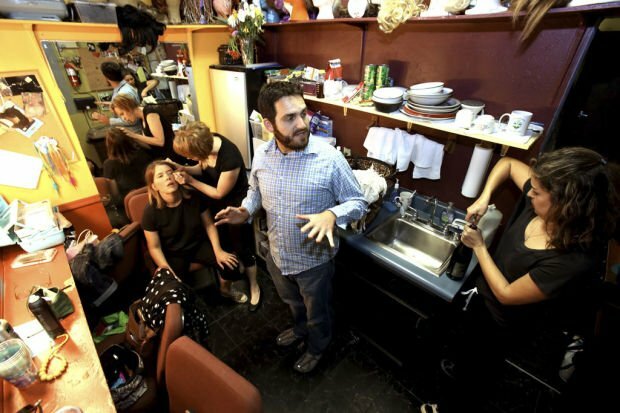 The director told the performers that the 10-week class wasn't about the final product, the performance, but getting outside of comfort zones and having fun. We huddled in the dark, breathing deeply, nervously. "It's almost time," someone whispered. "Everybody ready?" My heart was pounding, my stomach lurching. Earlier, as a joke, I'd dangled an airsickness bag in front of my fellow thespians, asking if anyone needed it. Well, I sure did now. The soft notes of "Cabaret," plinked out on the piano, drifted back into the wings, cuing us to our first number. We couldn't put it off any longer. It was time. The door swung open; we scrambled out into the theater. Up flashed the blinding stage lights, blurring people in the audience into fuzzy halos. "It will be so much fun. You have to do this." My co-worker Patty was on the other end of the phone. She ticked off the names of people she'd already sucked into taking the Live Theatre Workshop's adult musical theater class. Patty can be pretty persuasive. Or pushy, depending on how you looked at it. But the truth is, it did sound kind of fun. Sounded kind of dirty, too, adult musical theater? No stripper poles were involved - it was classified as adult because Live Theatre's classes are mostly for kids and teens. I was one of those. Once. A long, long time ago in a southeast-side high school, a little, darkened theater was where I found myself. In high school - no matter the generation - you've got some basic categories: jocks, burnouts, band nerds, drama nerds, school nerds. I straddled those last two, but after auditioning for the school musical as a freshman, I identified with the theater kids. It was just a small part in "Oklahoma!" but I was hooked, taking drama classes, even going to a few, open casting calls for movies. In college, I auditioned for the local Gaslight Theatre, known for its fun, high audience-involvement melodramas. Didn't get a part. And that was that. At the risk of sounding like a voice-over from one of those poignant, coming-of-age movies, you grow up. You realize dreams are just that, dreams. You move on, and that's OK. In fact, that's life. No regrets. Here was a chance to revisit acting and that special cast comaraderie for 10 weeks. Whoa. That sounded like a long time. Plus, there was a performance at the end. "You don't have to do it," Patty insisted. Yeah, that turned out not to be true. But, even if a live performance didn't sound as exciting as it once did, an hour and a half out of the house every week sounded pretty darn awesome. Maybe I'd even get out of fixing dinner. That first class, I had butterflies. Or so I thought. It could've been the Red Vines - I'd been chain-eating them before I left the house, looking for strength in sugar. Live Theatre, with its dim lighting and small stage, felt both scary and like home. "I was thinking about what I was going to say to you, and there are two things," Michael Martinez our director, told us. "First, I want to tell you, you shouldn't be scared. The second thing is, you should be scared." This class, he said, wasn't about the final product but getting outside of our comfort zone - and more importantly, having fun. Our group of seven included a preschool director and associate director, a college academic advisor, a retired Air Force guy and three jaded journalists. Six of us had dabbled in acting once upon a time in school. Theater now, to three classmates who were moms, meant shuttling kids to Live Theatre's classes. Martinez handed us each an apple-red folder. "There's homework." Tucked inside were a syllabus, sheet music and scenes from contemporary plays. In a few months, we'd perform this stuff. But first, we had to memorize - lines, dance steps, songs. We'd use parts of our brains that'd long been dormant. Did they even work any more? Week after week, we practiced and did goofy warmups. While Martinez marveled at working with adults who have fully-developed motor skills, he failed to realize we weren't as agile as the kiddos he usually teaches. "Be a banana, be, be a banana," he chanted, his arms flailing. We gamely followed along, until Martinez got down on all fours and flopped onto his back, "Be a cow, be, be a cow. Have a cow, have, have a cow." Grownups don't do that, we had to tell him. Not because it's silly but because that is how you throw out a back and screw up knees. It took several classes before we - OK, me - didn't feel like a stiff drink was needed before walking into the little theater. It became fun. When one week was canceled, we got together anyway and held our own practice. Things were trucking along nicely, until the final run-through. Everyone felt unsure. We tried to get Martinez to push the show back. Ever upbeat, he talked us off the ledge. In a way. "Let's jump," he said. "We've got a parachute - you've been working for weeks. You know this." But just in case, Amanda Gremel - who'd co-taught the class and choreographed our dances - would be stationed in the front row, with scripts, and subtlely miming dance steps. She'd have our backs. If the worst happens and we blank, Martinez said, it's OK. "My biggest note for everybody: Don't freak. If you go blank, just be quiet. Don't break character. Although it feels panicky and scary, people out there in the audience don't know." Plus, Gremel reminded us, "It's friends and family who'll be watching." Not necessarily the friendliest audience. My youngest kid asked if he could bring tomatoes. Backstage, just minutes before curtain, we organized props and costumes and tried not to panic. Some squeezed drops of Rescue Remedy, a homeopathic de-stress potion, into their mouths while others relied on a few sips of a not-so-homeopathic stress reliever that required a bottle opener. We scurried out, in a line, taking our places and even though just a half hour earlier Martinez had run us through the dance numbers twice, I got flustered. Nervous, anxious, excited, I kicked my right leg and squeaked out the first notes of "Lullaby of Broadway" before quickly realizing my mistake: "Cabaret" was the opener. From my quasi-hidden, or so I hoped, spot in the back I looked up at the front row. Diana Wilson - the academic advisor whose sons are Live Theatre veterans - was beaming. A month into the workshop, as a few of us - OK, me - grumbled about singing solos Wilson said, "What's the worst that can happen? We make fools of ourselves every day." And, we didn't make fools of ourselves. Sure we forgot some lines, and did a few dance steps at the wrong time. But no one threw up or had a panic attack or flat-out collapsed on stage. Even the arts writer, who had threatened to do just that, stayed vertical through the whole thing. The 45-minute show seemed to go at warp speed; it was over as quickly as it started. Our audience clapped and whistled appreciatively. "What a rush!" Kariman Pierce exclaimed, as we hurried to clear out before the real actors arrived for a show. For her, the performance was a chance to check something off the ol' bucket list - she'd wanted to perform "Nothing" from "A Chorus Line" since she was in high school but hadn't had the nerve until now. Pierce's friend and co-worker, Jenny Douglas, spoke eloquently at the very first gathering about how, as a preschool director, she asked kids to take risks all the time. It was only fair she did. "Life is too short not to take a risk," she said. Her three kids - who dubbed the class "Grown-up Glee" - all caught the acting bug after watching her perform. For busy retiree Bruce Krech, Adult Musical Theater gave him a chance to share a hobby with his two granddaughters. And for everyone, it was a chance to bond over the shared, anxiety-filled experience that is live theater. Most of us are at a point where our lives really aren't our own - we're putting our families first, shuttling kids to their activities, cheering on their victories. This was all ours. I think the best part was the flurry of emails the morning of the show, venting about nerves, tossing off lines and just encouraging each other. When we left the theater that Saturday evening, we said we'd see each other again in the fall. Maybe we all will. At the very least, I'm going to pretend there's still class Saturday afternoons. •MixTape - an adult, ensemble class that focuses on physical theater - holds its performance 7:30 p.m. May 23. 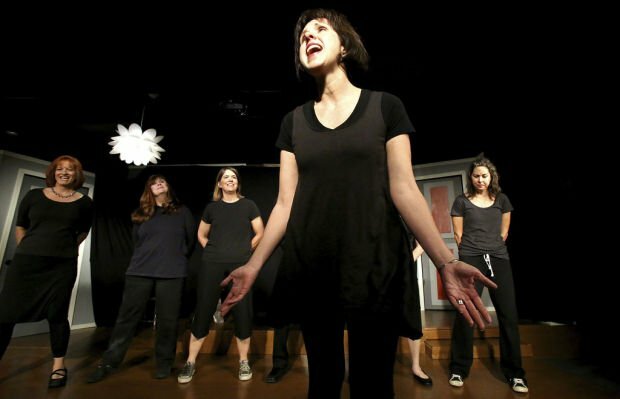 •The next adult musical theater class is scheduled to start Aug. 10.